Job Klijn came to New Zealand in 1988. Klijn says the stories he tells in his paintings are not just his own, but they come from his French wife, friends and other immigrants that he has met. All of Klijn’s materials are recycled. He uses old house paint, varnish and stains to build heavy textures, painting on hardboards, floorboards, pallet wood or anything he can get his hands on. 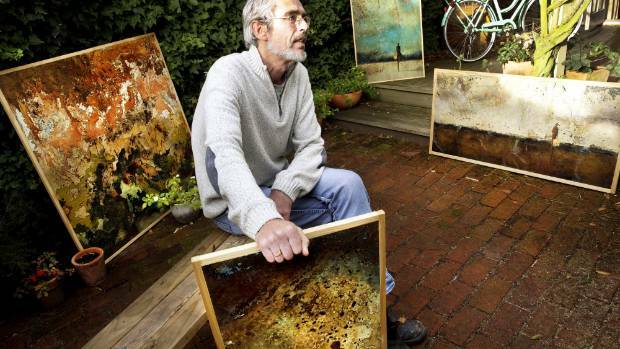 Soil, string, a rusty hinge and an old tap also make it into his works. He says he loves old. Klijn says he starts his paintings with a layering and then goes on to add other elements, outlines and sometimes figures.